The Science of Disguise exhibition was selected and written by Dr William Abberley, Leverhulme Research Fellow in Literature, Science and Medicine, University of Oxford. In the mid-19th century, nature seemed a stage of tricks and deceptions. Earlier naturalists had noted that some animals appeared to disguise themselves as a means of survival, but they viewed this as just a minor detail of God’s creation. Yet Darwin’s theory of evolution by natural selection challenged this view, describing a world of constant change, competition and extinction. In 1864, the Victorian naturalist Alfred Russel Wallace went public with his theory that organisms evolved to mimic each other. Building on the ideas of his colleague Henry Walter Bates, Wallace argued that insects deterred predators by resembling other, inedible species. Organic disguises could be understood as evolutionary adaptations. 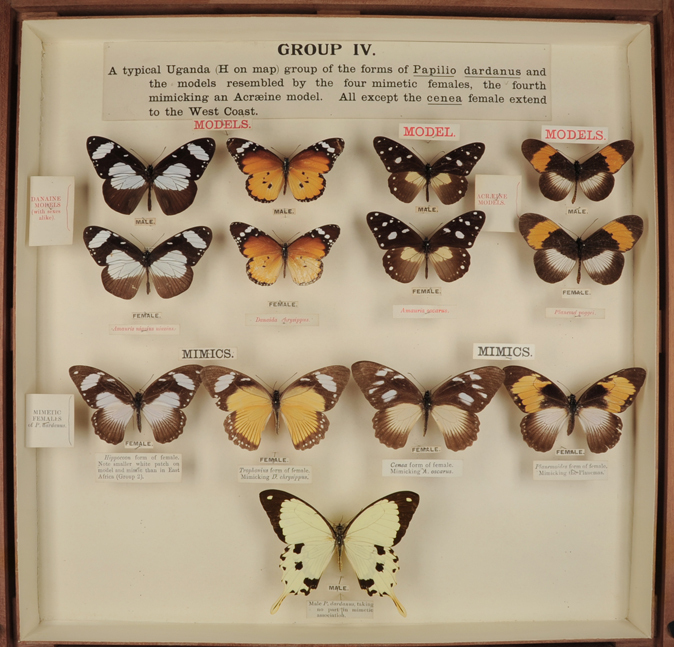 This display from the 1924 London British Empire Exhibition shows how the females of one African butterfly (Papilio dardanus) mimic distasteful species to trick predators. This exemplifies Bates and Wallace’s mimicry by natural selection. The females slowly evolved to resemble the other species, while their less mimetic relatives died out. Exploring the jungles of South America, Bates and Wallace often noticed one species resembling another in order to trick prey or predators. Animals also used camouflage, mimicking the bark or leaves they rested on. 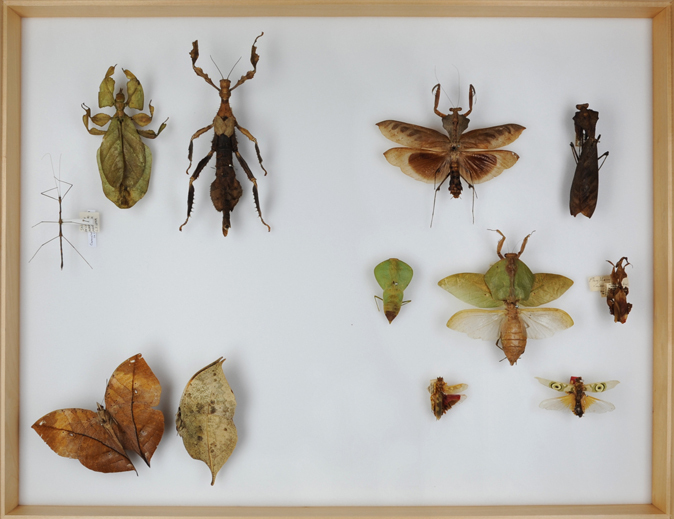 Top-left in this image are stick insects resembling a twig and leaves in different seasons; right, mantids that blend into their habitats and also with eye spots and red warning colouration; bottom-left, an Indian leafwing (Kallima paralekta) with wings open and closed. Scientists have since discovered new forms of natural mimicry in organisms’ sounds and smells, as well as their visual appearances. Behaviour can be deceptive too, including displays of apparent strength and playing dead. Some animals even have one body part that resembles another part to protect their weak spots, such as snakes whose tails mimic their heads.